I recently posted about a college student in Indiana who finds great pleasure and solace in watching squirrels. Today I bring you the opposite: Four narratives from Washington University (in St. Louis) students who had awkward encounters with squirrels. The students show no mercy, calling them “fat rodents,” “pretty disgusting,” saying they ” have rabies,” and even resulted in “the most embarrassing moment of my life” for one young lady. One student (not the embarrassed one) had a squirrel land on her face as she was touring campus as a high school senior. Now that’s embarrassing. I totally understand that. The other young lady merely ended up sounding like she has been overly sheltered thus far. But I’ll let you be the judge now: Here’s the story. Wow, this is a really sad squirrel story — a squirrel in Florida jumps onto the face of a toddler, and won’t let go. In the process, the boy’s rescuers are injured, too. This poor child is going to develop a terrible fear of squirrels, I’m sure. 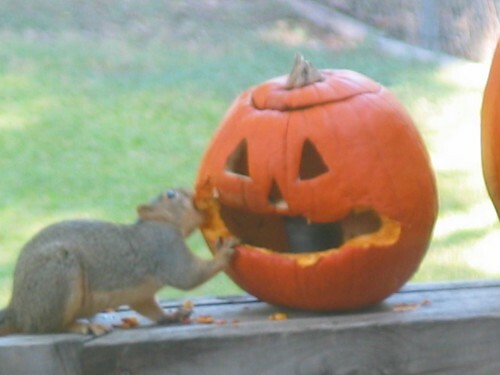 Like some of the readers, I too wonder if this squirrel has rabies?